Investigation is the act of discovery and analysis of data. While investigating evidence in an organization, the analyst acts like Sherlock Holmes, the fabled detective from 221B Baker Street. As the systems analyst works to understand users, their organization, and its information requirements, it will become important to examine different types of hard data that offer information unavailable through any other method of data gathering. Hard data reveal where the organization has been and where its members believe it is going. To piece together an accurate picture, the analyst needs to examine both quantitative and qualitative hard data. Many quantitative documents are available for interpretation in any business, and they include reports used for decision making, performance reports, records, and a variety of forms. All these documents have a specific purpose and audience for which they are targeted. A systems analyst needs to obtain some of the documents that are used in running the business. These documents are often paper reports regarding the status of inventory, sales, or production. Many of these reports are not complex, but they serve mainly as feedback for quick action. For example, a sales report may summarize the amount sold and the type of sales. In addition, sales reports might include graphical output comparing revenue and income over a set number of periods. Such reports enable the decision maker to spot trends easily. Production reports include recent costs, current inventory, recent labor, and plant information. Beyond these key reports, many summary reports are used by decision makers to provide background information, spot exceptions to normal occurrences, and afford strategic overviews of organizational plans. Most performance reports take on the general form of actual versus intended performance. 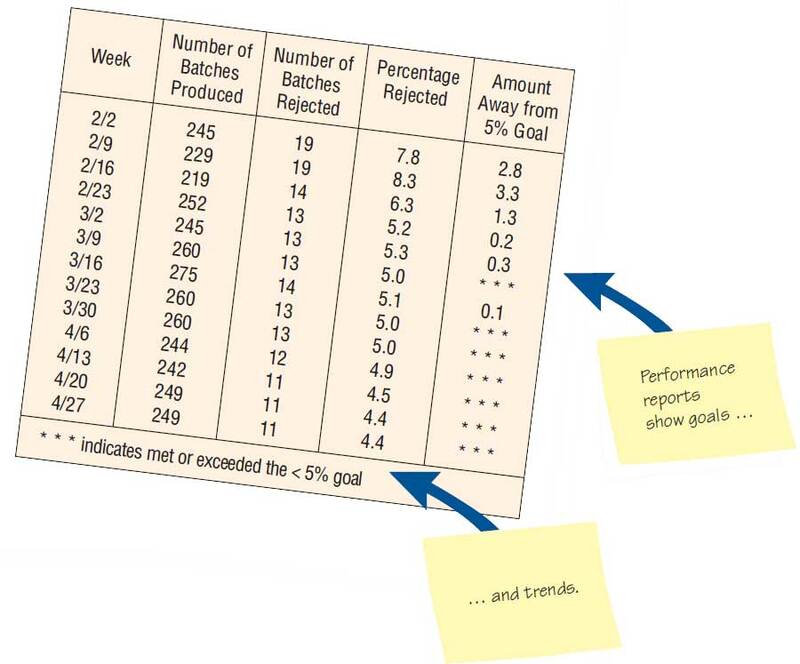 One important function of performance reports is to assess the size of the gap between actual and intended performance. It is also important to be able to determine if that gap is widening or narrowing as an overall trend in whatever performance is being measured. 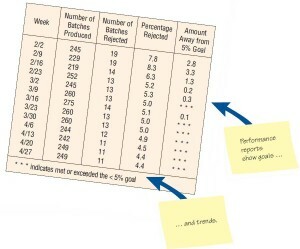 Figure 1 shows a clear improvement in sales performance over two to three months. The analyst will want to note if performance measurement is available and adequate for key organizational areas. Checking for errors in amounts and totals. Looking for opportunities for improving the recording form design. Observing the number and type of transactions. Watching for instances in which the computer can simplify the work (i.e., calculations and other data manipulation). 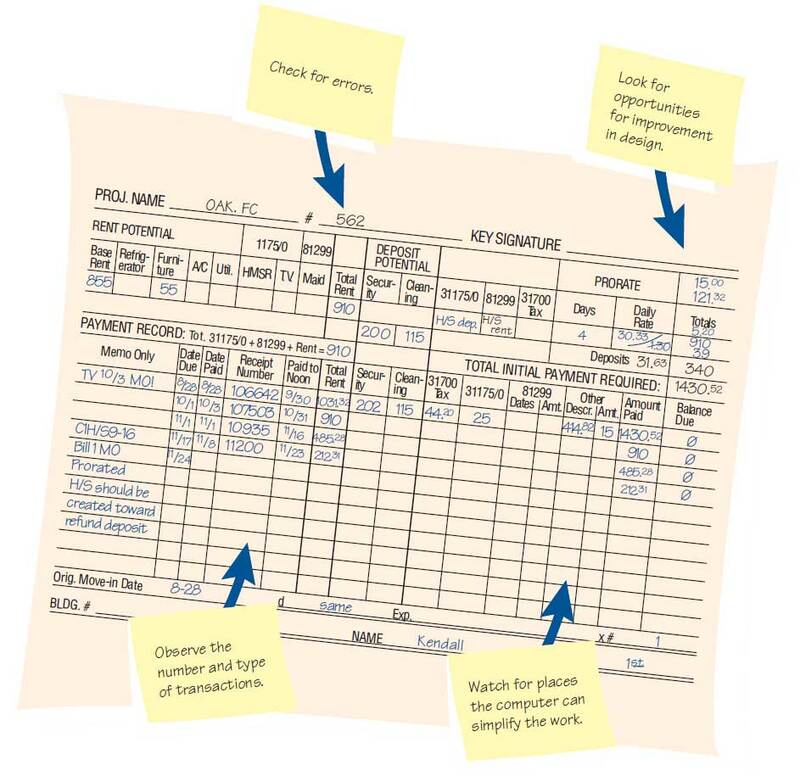 Figure 2 – A manually completed payment record. 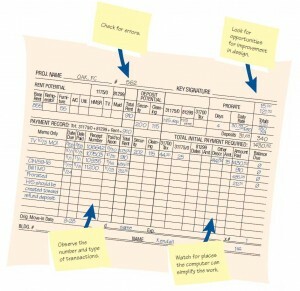 Blank forms, along with their instructions for completion and distribution, can be compared with filled-in forms to see if any data items are consistently left blank on the forms; whether the people who are supposed to receive the forms actually do get them; and if they follow standard procedures for using, storing, and discarding them. Remember to print out any Web-based forms that require users to print them. Alternatively, electronic versions that can be submitted via the Web or email can be identified and stored in a database for later inspection. Collect examples of all the forms in use, whether officially sanctioned by the business or not (official versus bootleg forms). 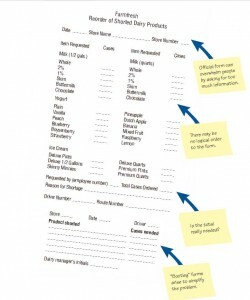 Note the type of form (whether printed in-house, handwritten, computer-generated inhouse, online forms,Web fill-in forms, printed externally and purchased, etc.). Document the intended distribution pattern. Compare the intended distribution pattern with who actually receives the form. Is the form filled out in its entirety? If not, what items have been omitted, and are they consistently omitted? Why? Are all copies of forms circulated to the proper people or filed appropriately? If not, why not? Can people who must access online forms do so? If there is a paper form that is offered as an alternative to a Web-based form, compare the completion rates for both. 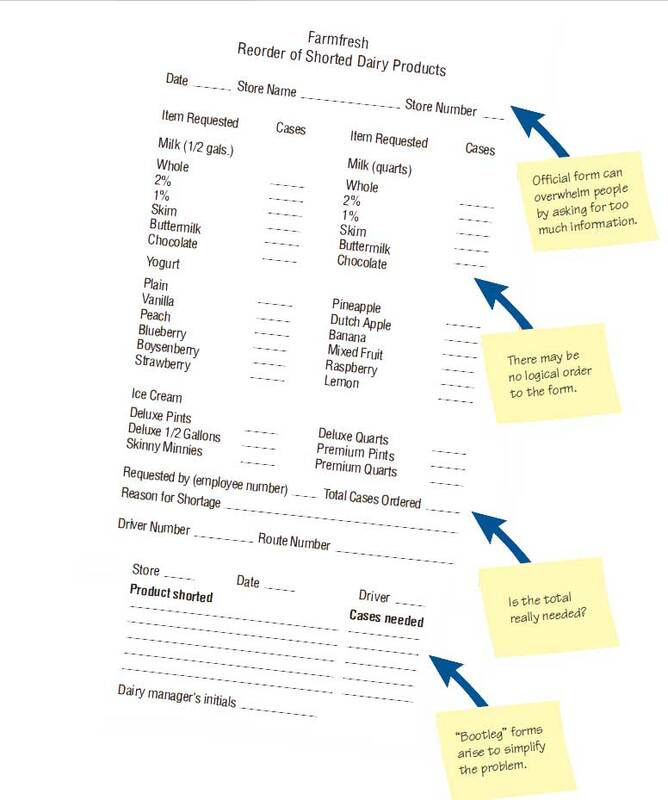 Figure 3 – Questions to ask about official and bootleg forms that are already filled out.